Diversifying your investments: Are you getting your free lunch? Long term investors embrace the promise of diversification across and within asset classes based on Nobel-winning research in Modern Portfolio theory (1) which showed that mixing certain assets together not only improves the return earned, it also decreases the risk needed to earn it. Who said that there is no such thing as a free lunch? The free lunch stems from a tendency, in the long term, of different assets to react differently to economic events. Yet many misunderstand diversification. To help demonstrate the concept, consider the following four asset classes represented in the chart (Figure 1). The first is the US stock market, the second world-wide non-US stocks. The last two asset classes are less common but provide a good contrast to the first two. They are real estate investment trusts (REITs) and Commodities. Over the last thirty years, these asset classes had short term volatility and returns that varied considerably from each other. 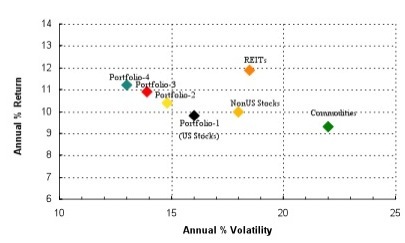 Figure 2 illustrates that REITs, World-wide Non-US stocks, and Commodities all have higher volatility than US stocks. REITs had almost 12% average annual return while enduring an eye-popping volatility (measured by standard deviation) of 22.5%, while US stocks performed lower (less than 10%) with a volatility of 16%. If these were the only two asset classes available, investors who wanted the best annual return would choose REITs while those who prefer a smoother ride would choose US Stocks. But would this really be the best choice? Given our experience over the last three years, every investor can relate to a bumpy portfolio ride and knows how they feel about volatility. In Figure 1, you can observe the role that diversification plays to help the portfolio attain a smoother ride (lower volatility) while collecting higher returns. The advantage of true diversification can be seen when you combine Portfolio-1 which contains only US stocks with non-US World-wide stocks to create Portfolio-2. What do you see? A new portfolio with a higher annual return AND much lower volatility! But is this amazing result only specific to combining non-US World-wide and US stocks? Not if you look at Portfolio-3 and Porfolio-4. In these two portfolios we add sequentially REITs and Commodities and in each case we see an increase in the portfolio return with a further decrease in the overall volatility. To maximally grow your portfolio and fully benefit from diversification you will also need to rebalance it. Rebalancing of asset classes and returning the portfolio to the original asset mix is an essential way to capture market gains. The talent needed during rebalancing is the ability to separate your emotions from the task at hand and do it in a disciplined manner. You will need to sell positions that are doing well while buying positions that are currently underperforming. This is rarely as easy as it sounds. 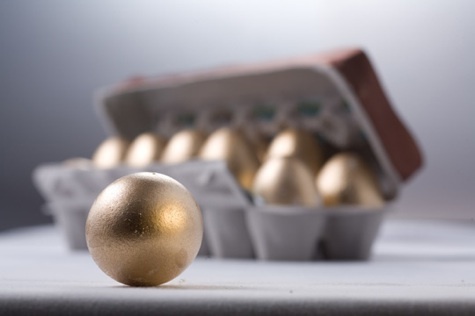 If an advisor creates a portfolio with an asset mix appropriate for your risk tolerance, review and understand the portfolio before implementing it. A wealth building portfolio will hold securities that are low cost, high quality (good performers) and representative of several asset classes. It is important that you verify that the funds chosen actually mix uncorrelated securities and are not just more US stocks added to a portfolio that already has a complete basket of US stocks or funds. Although diversification is not the only way to counter risk, it is certainly one way that combined with disciplined rebalancing has produced excellent returns. Diversification is the investor’s ticket to a free lunch. Ask yourself, are you missing out? Figure 1: Why Diversify? Return-risk (volatility) chart, 1972-2010. Modern Portfolio theory was first described by Henry Markowitz in 1952. The equivalent proverb “Don’t keep all your eggs in one basket”, dates to 17th century Italy.